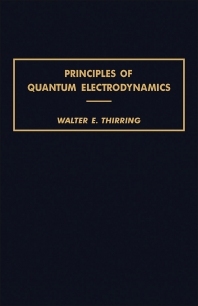 Principles of Quantum Electrodynamics concentrates on one of the best understood parts of quantum field theory, quantum electrodynamics. It emphasizes the physical basis of the theory and avoids purely mathematical details. For this reason, the book should not be taken as a handbook of field theory, but rather as a compendium of the most characteristic and interesting results which have been obtained up to now. The book is organized into four parts. Part I develops the general mathematical framework, covering units and orders of magnitude, classical electrodynamics, and the general formalism of the quantum theory of fields. Part II deals with free fields. It examines some problems concerning the physical interpretation of the theory and asks whether the quantization procedure adopted actually introduces quantum characteristics and, if so, how these are expressed by the formalism. It also investigates the expectation values of more complicated expressions. Part III examines the effects of a mechanism which produces the particles under consideration; i.e., an external source of the fields. Part IV deals with quantum fields in interaction. The focus is on the case of a quantized electromagnetic field, the source of which is a quantized Dirac field.